I would like to share the way to commercialize 'BlocKing - light in the dark'. 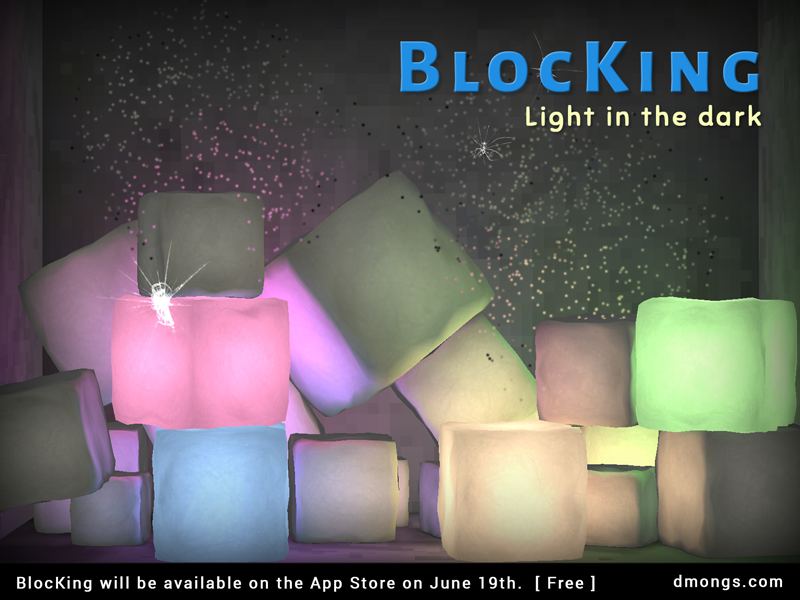 *BlocKing is a beautiful mobile game. It's due for release on the App Store on June 19th. There are different commercializing strategies in ads. Many games are still using banner ads. As soon as App is executed, pop interstitial AD up or whenever play ends, it shows interstitial AD. All of these methods provide discomfort to users, which are the most afraid part for us. Users will feel thankful when looking at special objects native advertisement attached when tab count lacks during play. And favor for this native ad will be helpful to click ad shown on resulted window after play. 'Other game view' is additional ad commercializing strategy. 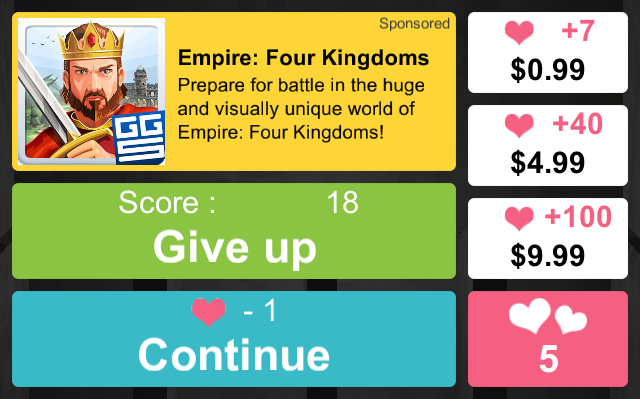 Also, 'other game view' button has also advantage, making button image like our UI such as native Ads. Other games have this type of little button at the corner. However, we doubt if the button is efficient. We decided to make this button bigger like banner Ads. However, the button should not be seen all the time but appears naturally along with other UI not to disturb play screen. So, for the time when users don't play games, after certain period of time, it was intended to appear naturally by fade animation. In addition, like other UIs, it disappears together when appreciation mode comes out. If Ad is sub-dish, iAP is main dish of BlocKing. BlocKing can be enjoyed freely regardless of network or consumed lift. However, if user misses object to finish game, user can use life item for 'continue'. On this blog, we will upload constant process and results of commercialization and marketing. Please give more care and interest in BlocKing and DMONGS. Home : Regardless of scores, cube object can be appreciated. 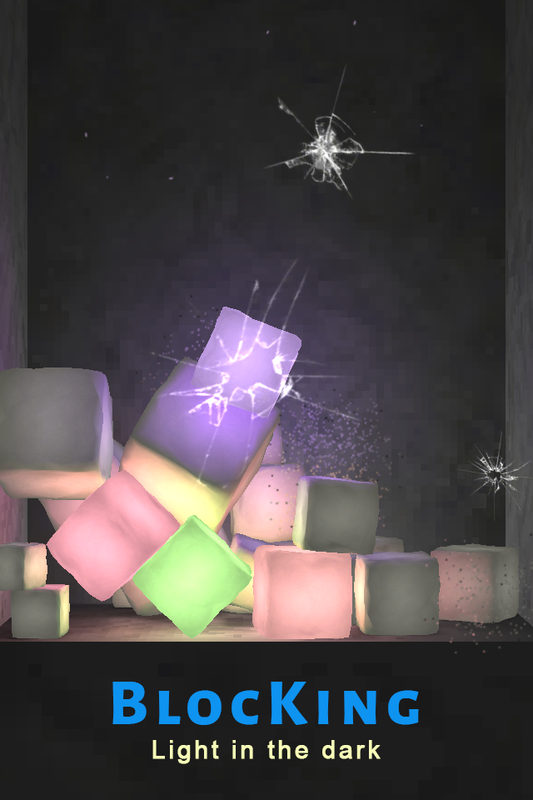 There are simple interactions to become particles by tabbing cube objects. Unless touching UI for certain period of time, UI disappears since it changes into 'appreciation mode' and only 3D space appears. Play : Objects fall from upward. They must be blocked before they reach below screen. Objects are largely divided into common objects and special objects. Common objects should be blocked by creating blocks on the bottom of screen. Special objects should be blocked by blocks or tabs. Common objects increase numbers which can make blocks whenever they appear from the top. However, special objects don't increase numbers. If special objects run out numbers to make blocks without tab, game will be over. If special objects are tabbed, the ability of relevant objects will be exercise. Particularly, if special objects native ads are attached are tabbed, numbers to make blocks increase. Falling objects sometimes change their directions when facing obstacles on the screen, which requires of concentration. Obstacles change their arrangements or move to animation. The way of play will be added. The way only common objects fall and the way only special objects fall are under manufacturing. Obstacles animation will be added. Obstacles moving up/down/left/right are under manufacturing. Achievement will be added. By providing with scores and levels to each achievement item, according to total sum, grades are provided to users. This grade can be increased only when games are played well and different BlocKing are enjoyed. In addition, every certain period, scores and levels of each achievement fall. Therefore, frequent access will be required. During games, it displays remaining scores to catch up with the friend's top score and compares scores of other friends. BlocKing - light in the dark (이하 블로킹) 수익화 방법을 공유하고자 합니다. * 블로킹은 아케이드 장르의 아름다운 모바일 게임입니다. App Store 에 6월 19일에 출시 예정이고 Android 에 7월 중에 출시 예정입니다. 그래서 우리는 앱을 무료로 배포하여 가능한 많은 사람들이 즐길수 있도록 하고 빠른 출시와 꾸준한 업데이트로 지속적인 사용자를 늘리는 전략을 세웠습니다. 광고에도 다양한 수익화 전략들이 있습니다. 많은 게임들이 아직도 배너광고를 사용합니다. 앱이 실행되자마자 전면광고(Interstitial AD)를 띄우거나 플레이가 끝날때마다 전면광고를 보여주기도 합니다. 이 방식들 모두 유저에게 불편함을 주고 이는 우리가 가장 두려워 하는 것입니다. 유저가 플레이 도중 탭 카운트가 부족할 때 이 네이티브 광고가 붙은 스페셜 오브젝트를 보면 고맙게 느껴질 것입니다. 그리고 이러한 네이티브 광고에 대한 호감은 플레이가 끝난 뒤 결과창에서 보여지는 광고 클릭에 도움을 줄 것입니다. '다른 게임들 보기'는 추가적인 광고 수익 전략입니다. '다른 게임들 보기’ 버튼 역시 네이티브 광고처럼 버튼 이미지를 우리의 UI와 같게 만들 수 있는 장점이 있습니다. 광고가 서브요리라면 iAP는 블로킹의 메인요리 입니다. 블로킹은 유저가 네트워크나 소모되는 라이프에 상관없이 자유롭게 즐길 수 있습니다. 단, 유저가 오브젝트를 놓쳐서 게임이 끝나면 ‘이어하기’를 위해서 생명 아이템을 사용할 수 있습니다. 이 블로그에 꾸준히 마케팅과 수익화의 과정과 결과를 올리도록 하겠습니다. 앞으로 블로킹과 DMONGS에 많은 관심 부탁드립니다. 홈 : 점수와 상관없이 큐브 오브젝트들을 감상할 수 있습니다. 큐브 오브젝트들을 탭하여 파티클화 되는 간단한 인터렉션이 있고 UI를 일정시간 이상 건드리지 않으면 ‘감상모드’로 바뀌어 UI가 사라지고 3D 공간만 보이게 됩니다. 플레이 : 위에서 오브젝트가 떨어지고 화면 아래에 가기전에 막아야 합니다. 오브젝트들은 크게 일반 오브젝트와 스페셜 오브젝트로 나뉘는데 일반 오브젝트는 화면 하단에 블럭을 만들어 막아야 하고 스페셜 오브젝트는 블럭으로 막거나 탭하여 막을 수 있습니다. 일반 오브젝트는 위에서 나올 때마다 블럭을 만들 수 있는 숫자가 늘어나지만 스페셜 오브젝트는 숫자가 늘어나지 않으므로 스페셜 오브젝트는 탭하지 않으면 결국 블럭을 만들 수 있는 숫자가 바닥나서 게임이 끝나게 됩니다. 스페셜 오브젝트를 탭하면 해당 오브젝트가 가진 능력이 발동됩니다. 특히 네이티브 광고가 붙은 스페셜 오브젝트를 탭하면 블럭을 만들 수 있는 숫자가 늘어납니다. 떨어지는 오브젝트들은 화면의 장애물을 만나 방향이 바뀌기도 하므로 집중력을 요구합니다. 장애물들은 배치가 바뀌거나 애니메이션으로 이동하기도 합니다. 일반 오브젝트만 떨어지는 방식과 스페셜 오브젝트만 떨어지는 방식을 제작중입니다. Achievement 가 추가되고 각 achievement 항목에 점수와 레벨을 주어 총 합에 따라 유저에게 등급을 부여합니다. 이 등급은 게임을 잘해야 할 뿐만 아니라 오랫동안 다양하게 블로킹을 즐겨야 올라갑니다. 또한 일정 기간마다 각 achievement 항목의 점수와 레벨이 떨어지므로 자주 접속하게 합니다. 게임중에 친구의 최고점수까지 남은 점수를 보여주고 결과창에 다른 친구들의 점수를 비교합니다.